Awareness of being able to use smartphones to pay for products and services at point of purchase has reached critical mass among a key demo: users of mobile banking apps, which represent 36% of all Canadians smartphone users, accounting for nearly 4 million people. Of those users, 56% of them are aware of an upcoming service that would allow them to swipe their phone to pay for goods and services at check out, according to results from our Digital Life Canada Survey. That figure is up from 47% a year earlier. Why the increase in awareness? 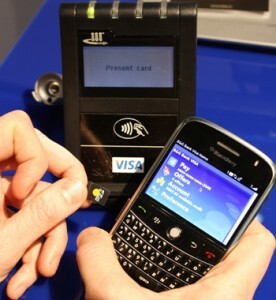 It may have to do with the buzz about NFC-chip enabled devices. Our study also found consumers with mobile banking apps are ‘very’ satisfied with the app they use most (67%, up from 63% the year prior), which may translate into their willingness to hear about other ways their mobile device can help improve their financial lives. Our study shows simple awareness of the mobile wallet concept translates into usage intent. Convenience, speed and the promise that it would mean they would have to carry fewer things with them was cited as the primary reason among 63% of respondents. Comments like, “who doesn’t have their phone glued to them all the time, much easier than carrying a wallet,” was a typical sentiment expressed by respondents. Still, many respondents also expressed an underlying concern about security, wanting to know more about the service before they commit to trying it. It will be up to the providers of a mobile wallet service to reassure consumers. In terms of service providers, we found mobile banking users would trust a variety of retailers and mobile brands who may offer new financial services via mobile. In an average rating out of 10 in terms of consumer trust level, chartered banks like TD, BMO were tops, with a trust score of 7.5. They were followed closely by credit card companies like American Express, Visa and MasterCard at 7.0; mobile phone manufacturers like Apple and RIM at 6.7; and retailers like Canadian Tire, Home Depot and Wal-Mart at 6.5. Wireless providers like Rogers, Bell and Telus scored 6.4. Still, telecom companies are the ones who already have a pre-existing relationship with wireless customers. Like financial companies, mobile manufacturers and mass retailers, telcos will have a shot at the potentially lucrative service that is the digital wallet. In a race for market share that has only just begun, there is no odds-on favourite.